Learn how the City of Sparks in Nevada replaced its Wi-Fi system using networking products from Aruba and Hewlett Packard Enterprise to create a mobile workplace for City Hall employees. Hear how we upgraded all switches to ArubaOS and used Layer 3 routing to replace older firewalls, how we interface with other agencies and the state of Nevada and how we are using Aruba ClearPass to enhance security. Find out how Aruba Beacons help people find city services at City Hall and learn about our outdoor “beacon” mapping system at our major Softball Regional Park. Stay after the session for an informal roundtable with HPE and Aruba Networking experts. Click here to register and add to your personalized agenda. The music business is transforming at a rapid rate. Join us to hear about the journey of the Society of Composers, Authors and Music Publishers of Canada (SOCAN) to the all-flash data center. Learn how SOCAN solves key business challenges by leveraging HPE 3PAR All Flash Arrays. 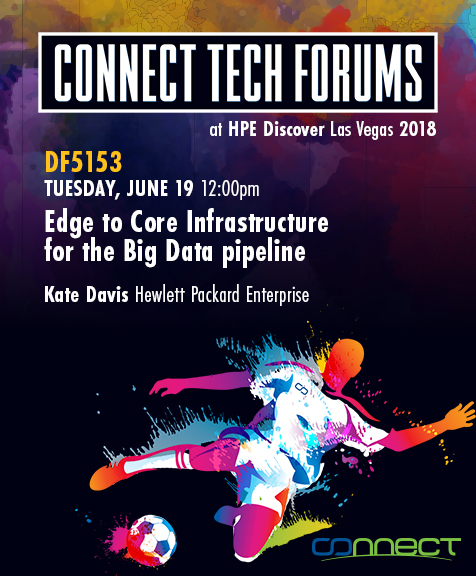 Stay after the session for an informal roundtable discussion about the latest news on the Storage Block with the HPE Storage Guru, Calvin Zito. Mission Critical computing requires level 4 availability, period. Blockchain for Enterprise is based on consensus from members of a permissioned network of businesses & verifiers. Every node of an Enterprise chain requires high bandwidth and computing power to run its business transactions & more. In addition to an architectural review, we discuss how a weak link may affect an Enterprise blockchain, and more importantly, how you can avoid being the weakest link. You will also learn ways on how you can protect your business from possible disruptions. With the latest HPE Apollo Gen10 platforms there’s a lot to discuss for Big Data Solutions. Come learn about new Reference Architectures and new benefits of Hadoop 3.0. Find out how HPE’s largest user community can help your organization leverage our global membership to create a partnership with local chapters, members, and an advocacy program for a successful project deployment. 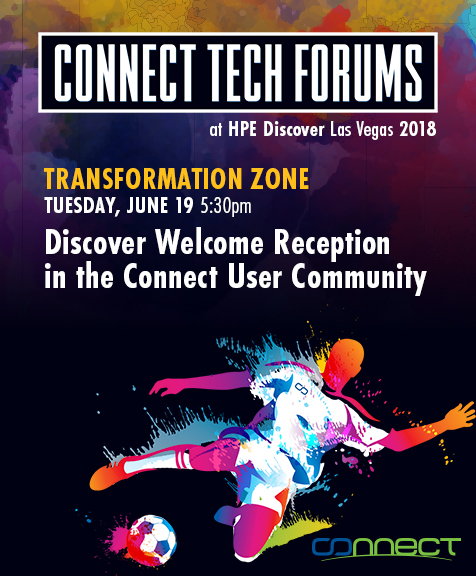 We will showcase our two publications, “The Connection” a Journal for the NonStop Community, and “Connect Converge” our Quarterly Online HPE Enterprise Technology publication. Learn how HPE Partners work with Connect Members to build long term relationships that make your customers successful, which allows you to be successful too. By invitation only. Details TBA. As the City of Sparks in Nevada begins their shift to HPE Synergy, a lot of research and thought is involved in the planning process. As our aging c7000 blade chassis’s are nearing end of life, hear a discussion about our move to HPE Synergy and the steps we are taking to make sure that our plans allow the city’s Infrastructure Team to stay ahead of the curve. We are all so fully connected that sometimes we forget how much of our lives are lived online. None of us can live without the Internet or our connected gadgets. The convenience of having a small computer in our pocket is unmeasurable. Kids born in the last 30 years don’t know what a set of encyclopedias is. All this knowledge and access has a downside that you can’t ignore which is the security implications of living on the web. To ensure that we are protecting our customer data, a data-centric approach is required. This talk will discuss the various regulations and how companies must change the way they protect data. Stay after the session for a roundtable discussion on enterprise security. From the data center to the network, big data and social networking, security is now a crucial part of every IT conversation. Connect with the experts at this Roundtable discussion about enterprise security. Share best practices, offer feedback and speak directly to HPE technologists in a small, intimate setting. Hear Data Protection Use Cases from companies who are greatly concerned about reducing their risk of a data breach and want to reduce their compliance scope. Understand how they are using security tokenization to reduce and remove sensitive data from their systems, and the options in place that allow companies to extend security tokenization from on-premise locations to hybrid infrastructures and to cloud deployments. Understanding enterprise technology spend to effectively optimize both cost and value is now more critical than ever. For decades, IT leaders have utilized the HPE Renew Program to respond to squeezed budgets, outmaneuver product constraints and maximize their HPE business investment. We’ll discuss the HPE Renew Program’s history and remanufacturing process, product SKUs, custom builds and current inventory, and share winning examples and real-life scenarios. do you understand what your organisation needs to do? NYDFS, GDPR & PIPA are some of the emerging privacy regulations that are challenging the status quo of business. Hear how a global insurance company began their journey of privacy compliance for their customers, and how these changes impacted the way they do business. Learn what have they been able to achieve so far, and how they were they able to leverage their protection options from their existing HPE technology solutions. Shall I stay or shall I go? What questions should you ask when considering the next move for your HP-UX infrastructure? Explore the impact of newly available Integrity i6 generation of servers, the great performance benefits of the NVMe integration and the future possibility of running HP-UX in containers on x86. Learn through customer case studies how customers are modernizing their UNIX infrastructure. Stay after the session for an informal roundtable discussion with Jeff Kyle and other HPE HP-UX experts. Hewlett Packard Enterprise is adapting and changing our learning modalities for today's digital native with the launch of the HPE Digital Learner Framework. This new content as a service subscription program increases access to meaningful learning, when and where you need it, in the modular form you want it, with incentives for both the students and the organization. Come and learn more about the program and get your digital badge to show your HPE proficient technology professional status.